There’s an old saying that one should be careful of what one wishes for because you may get it. And Ghost Rider fans did. As a story, the movie version isn’t much of a faithful adaptation. In order to do that, GHOST RIDER would have had to been a hard R movie to properly convey the supernatural/horror background of the character. But they absolutely get the visuals right and nowadays maybe that’s the best we can hope for. The totally kickass prolog narrated by Sam Elliott recounts the history The Ghost Rider, one damned soul selected by Mephistopheles (Peter Fonda) every generation to serve as his bounty hunter. Back in the Old West, a Ghost Rider stole a contract from the town of San Venganza, all of whose citizens sold their souls into damnation. 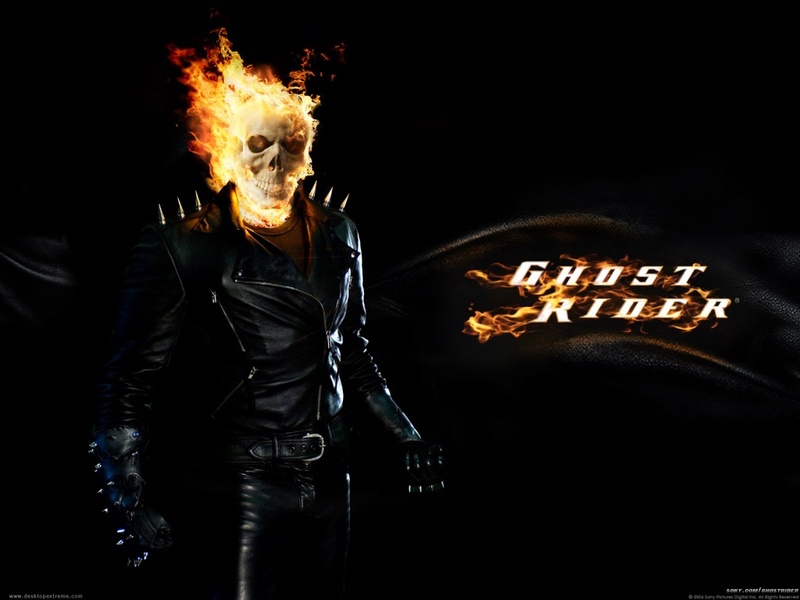 This Ghost Rider outran The Devil himself and hid both himself and the contract away. The opening itself made me wish the entire movie had been set in The Old West as we probably would have gotten something really cool. But I digress. Cut to the modern world. Young Johnny Blaze (Matt Long) and his father Barton (Brett Cullen) are daredevil motorcycle stunt riders for a circus. Johnny’s dad is dying from lung cancer and Mephistopheles appears one night and offers Johnny a deal: sell his soul and The Devil will cure Barton Blaze’s cancer. Of course we all know the danger of making a deal with The Devil and this is no exception. Barton Blaze dies performing a stunt and consumed with grief, Johnny leaves town and his one true love Roxanne Simpson behind. Jump to years later when Johnny Blaze (Nicholas Cage) is a world famous daredevil who is known for walking away unharmed from crashes that would have killed any other man. He encounters Roxanne (Eva Mendez) again and they pick up their relationship. Which is promptly sent into the toilet when Mephistopheles shows up and transforms Johnny into The Ghost Rider and charges him with the task of destroying his son Blackheart (Wes Bentley) who is after the Contract of San Venganza. To achieve his goal, Blackheart has enlisted the aid of three fallen angels who have taken on the aspect of Elementals of Earth, Air and Water. Of course, while everybody is after this blasted Contract it’s never really explained what either Mephistopheles or Blackheart intend to do with it once they get it. The Ghost Rider has a fight with Blackheart and his boys and afterwards ends up at a graveyard which is being tended to by The Caretaker (Sam Elliott) who seems to know just about everything about The Contract, The Ghost Rider, Blackheart…hell, he knows so much that they could just have had him narrating the first hour of the movie. It all finally comes down to The Ghost Rider having to face down Blackheart in the town of San Venganza to keep The Contract out of his hands and save Roxanne. Okay, let’s cut to the chase here: there’s not much of a story in GHOST RIDER. It’s a pretty straightforward origin story designed to do nothing but set up a franchise and on that level it succeeds. 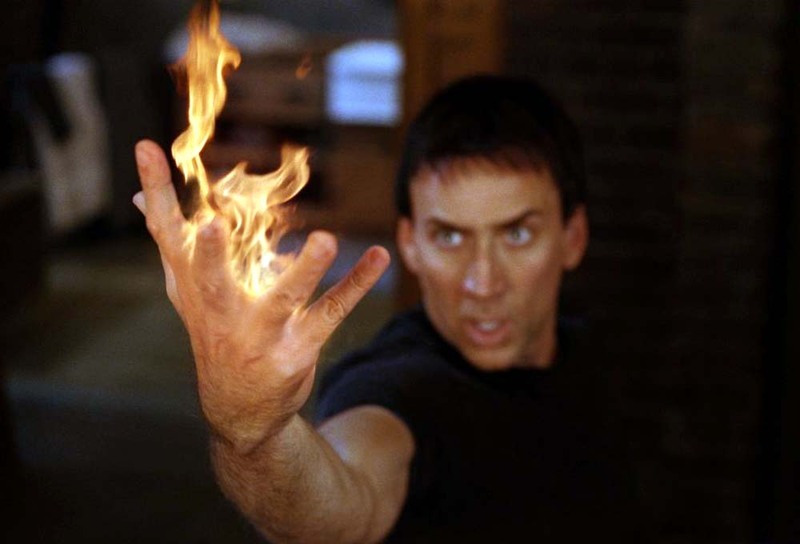 Nicholas Cage is obviously having a good time playing Johnny Blaze/Ghost Rider although I think he’s about fifteen years too old for the part. He doesn’t stretch himself trying to create deep characterization here and instead gives Johnny quirks like ‘drinking’ jelly beans from a martini glass and listening to The Carpenters before a dangerous stunt. Peter Fonda and Sam Elliott walk off with the acting honors in this one and if the movie had been set in The Old West with the two of them as the stars then that version would have been a stunner. Eva Mendez and her amazing cleavage is a lot of fun to look at even when the scenes she’s in have dull dialog. As for Wes Bentley…if he had any kind of artistic honor and integrity he’d give back the check he got for this movie. It’s been quite a while since I’ve seen an acting job quite this poor and uninspired. In fact, the main problem with GHOST RIDER is that the villains are so dull, bland and downright boring that there’s absolutely no suspense from start to finish. The three Elementals are literally blown away with no problem at all as The Ghost Rider simply walks right over them like they’re not there. And the final showdown with Blackheart hardly is worth sitting through the whole movie for. The writer/director of GHOST RIDER also wrote and directed “Daredevil” and I really get a sense in both movies that Mark Steve Johnson has a genuine love for these characters and wants to do them right. 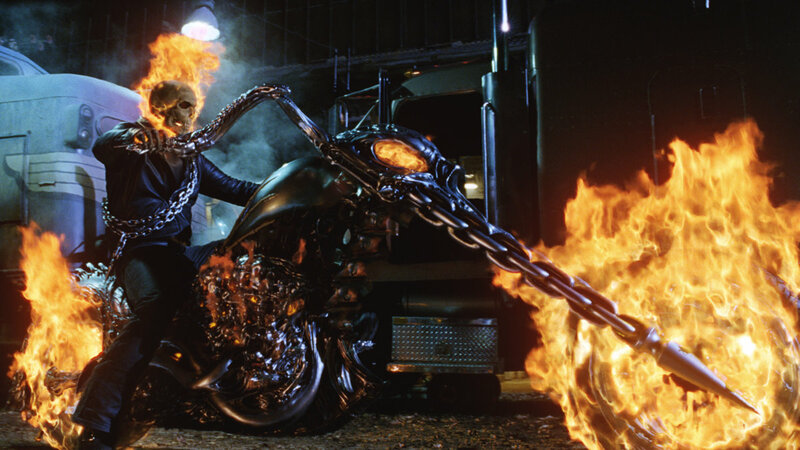 Especially The Ghost Rider as Johnson takes great pains to acknowledge at least four different incarnations of the character during the movie’s run time. But something just isn’t working. There was a H&R Block TV commercial featuring The Ghost Rider getting his taxes done that was more fun than this movie. “Daredevil” is the better movie but not by much. At least GHOST RIDER has the absolutely stunning visuals of the character and the equally stunning Eva Mendez to look at. So should you see GHOST RIDER? Chances are that if you’re a fan of the character you already have and you’re happy just to have seen the demon biker on screen and couldn’t give a poobah’s pizzle what I say. As for the rest of you who haven’t seen it, it all depends on much you like superhero movies, Nicholas Cage, Peter Fonda, Sam Elliott and Eva Mendez. GHOST RIDER isn’t a bad movie. Everybody (with the notable exception of Wes Bentley) tries hard. It just isn’t a very good one either. I liked Ghost Rider and couldn’t stand FF: Rise of the Silver Surfer. On these, we agree to disagree.